Gartner have published a forecast of smartphone device sales up to 2015 that indicates a continuing trend of market share growth for the Android operating system. The forecast asserts that Android will be pre-installed on just under 50% of all smartphone devices by 2012; as the os spreads down the price chain to feature on mid and lower price devices. 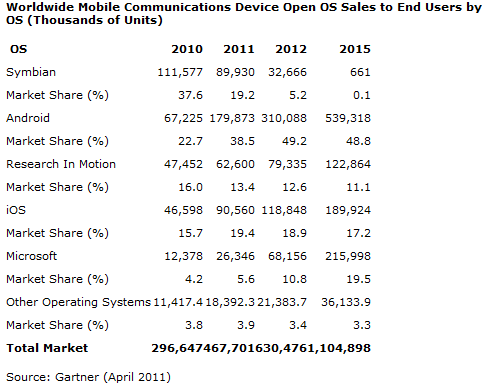 With Symbian abandoned by Nokia, in its adoption of Microsoft Windows Mobile OS, it will approach extinction by 2015. While Backberry OS is forecast to feature on nearly treble the current number of devices; while seeing a slight decline in market share, as the forecast percieves RIM are struggling to compete against the rise of Android and Microsoft Mobile. Apple’s iOS is also forecast to gain significant volume, remaining the second biggest platform worldwide, while losing some market share. But Gartner haven’t forecast that Apple will launch a cheaper iPhone handset, often referred to as the iPhone Nano amongst technology journalists, that could sit under the iPhone 5 or iPhone 6. Gartner’s forecast also seems to suggest that Samsung will reduce or even abandon the development of its current in-house os. Samsung has adopted Android to great effect on flagship smartphones and slates. But the in house os has featured on all low-spec, entry level devices; as well as as several mid-market products in the last 2 years. Gartner also haven’t mentioned the trend for Android to appear more uniform, with less tailoring possible by manufacturers, when implemented on different devices, making the emphasis in differentiation between touch-screen smartphones fall on processor speed, RAM and camera. As the screen quality and the form factor are all increasingly similar. This is then funnelling consumer choice toward whether they buy an Android, an Apple iPhone or a Nokia with Microsoft Mobile. Previously consumers considered whether they should they buy from Nokia, Apple, HTC, Samsung, Sony-Ericsson, or LG. But now the operating system is an active driver of the purchasing decision process. Blackberry remain relevant for the corporate email workforce. But the previous gains amongst students, driven by the need for social inclusion amongst classmates using Blackberry Messenger, is on the decline. As iOS and Android support apps that provide social networking with richer functionality. I’d be very thankful if you could elaborate a little bit more. Thank you! I’ve joined your feed and look forward to seeking more of your great post. Also, I have shared your site in my social networks!